Las Vegas is famous as the capital of gambling in the western world. Its neon lights are never dim and its wheels of fortune spin without end. The eyes of the gamblers are glued to the table and their only thought is to win. Nothing else matters in their lives. But, in another part of the city, there is a different world. In the East Flamingo Library, on October 24, 2012, the lights came on and a group of people in blue and white uniforms gathered to celebrate the 10th anniversary of Tzu Chi in the city. The branch officially opened its doors on November 19, 2002, with the warm blessings of Dharma Master Cheng Yen who called it "a surprise lotus blooming in the Gambling City". Over the last 10 years, the volunteers have helped many people -- they organized a grocery backpack distribution in the 'Happy Campus' program, visit a Blind and Retirement Center, distribute hot meals at a homeless shelter and do recycling. Through this decade of effort, the volunteers have impressed many Las Vegas residents. In recognition of this, U.S. House of Representative Shelly Berkley sent her office manager, Tod Story, to give a speech at the anniversary and present an award. Mr Story warmly praised four missions and eight footprints of the foundation and passed on the very best wishes of Representative Berkley. The evening began with a sign language performance by members of the foundation’s U.S. headquarters of the song "Free". Their beautiful lyrics and graceful choreography captured the imagination of the audience. Then the lights were turned off and a video "Today in History" was played; it described the foundation’s work in Las Vegas over the past 10 years. It had a tragic prelude. In 1999, a professor and a group of his students from Taiwan National Chung Cheng University had a fatal car accident in Death Valley; four people died and one was seriously injured. Tzu Chi had no office in Las Vegas, so volunteers came from Los Angeles and Phoenix to care for the students and their families. The graduate student who was seriously injured was hospitalized for more than four months; he was taken care of by a group of caring Las Vegas volunteers. Many became founding members of Tzu Chi office in the city. As an intersection of major highway routes, Las Vegas is plagued by severe traffic accidents. For the victims and their families, Las Vegas is no paradise but a place of sorrow. 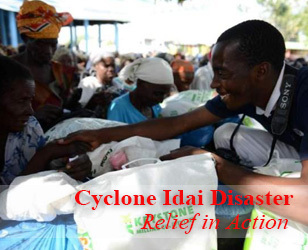 Fortunately, Tzu Chi volunteers are there to provide a pit stop for their sad journey and support them to recover from the trauma and return to a normal life. In March 2003, a Taiwanese tourist, Chen Dao-ming, was visiting his sister in Los Angeles. His family has arranged it as a happy holiday for him, but it turned out to be his final destination. At the time, there were few Chinese groups in Las Vegas; his family asked for help through a subscribers’ list of the North American Chinese Cable station. After many dead ends, someone called volunteer Cheng Ru-jing, who rushed to the hospital at 9 p.m. Chen had been losing blood continuously for four hours; the doctors had missed the chance to save him immediately because the family members with him had difficulties communicating in English. When the family decided to end his life support, Tzu Chi volunteers – who had little experience – decided to support the family in arranging the funeral. Chen Zhen-he played the role of a "model" to try on the clothing to be put on the deceased: Liu Ching-mei, Lee Kun-hwah, Lin Qiu-lan, Yang Shu-mei and others delivered meals to the family and took turns in accompanying them to the hospital: Zheng Ru-jing contacted the funeral homes and arranged a remembrance ceremony, as well as making the complex procedures to repatriate the body of Chen to Taiwan. Due to time constraints, the director of the Health Agency was "invited" from his vacation to sign the death certificate; with the request from the family, the volunteers even held a "soul-calling" ceremony in the MGM casino – the security guards assisted the family and volunteers to clear the space and made sure the ceremony went well. Chen Zhen-he also chanted daily sutras for him after his passing. Chen’s wife became Tzu Chi's recycling volunteer after going back to Taiwan and his daughter Chen Wen-cai is training as a certified Tzu Chi commissioner. His story was used in a play and made into a featured story in "Recycling Volunteers" on Da Ai TV; it has become famous among in Tzu Chi volunteers and supporters in Taiwan. To show the appreciation of the family, his daughter Chen Wen-cai hand-wrote a letter which was read out at the anniversary. Dear family in Las Vegas, I hope you are well! I am Chen Wen-cai. I was overwhelmed by emotion as I sat down to write this letter. My tears kept flowing and my heart ached. I had no idea how to completely express our family's gratitude. Back in the days when my father was visiting his family in the U.S., he took a trip to Vegas on his way back. Unfortunately he died of a heart attack. After all these years, I remember him and I remember the Vegas' Tzu Chi volunteers who helped us. I know there were many people who helped us. Before that, I used to donate to Tzu Chi occasionally and received publications about it, but I never took the time to learn about it. I never thought that our family would be in any kind of difficulty. Only after my father's passing did I realize that there are many things that money cannot buy. Before writing this letter, I flipped over publications and photos from the past ... and some books my father brought back from his trip in Hualien, about two weeks before he died. 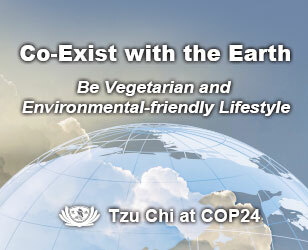 I remember him telling me: "Tzu Chi's vegetarian food was fantastic! And the Jing Si aphorisms really make sense!" He even showed me some sign language he learnt. Thinking back, he had had an affinity with Tzu Chi long ago. Although it pains me to lose him, I feel that he was a very fortunate man. Because, on his last journey in life, even though his own children could not be beside him, he had so many kind people sending him off, even though he had never met them before. I was overwhelmed with emotion when I read the articles sent by Ru-jing -- so many volunteers' names, so much paperwork. Fellow volunteers cared for my dying father, my panicking mother and us in Taiwan, arranged for the funeral -- "soul calling" – and did a great deal of paperwork for his return. They have helped us so selflessly and tirelessly. My mother was so comforted in her deep sorrow of losing her loved one. Even now she cries whenever she sees the sunset. I am grateful for our adorable and cheerful Ru-jing who always comes to visit us whenever she is in Taiwan. Since my father died, my mother pledged to be a Tzu Chi recycling volunteer. She started by collecting one truckload of recyclables a month and now collects three truckloads. At 72, she is still dedicated to the cause. Every time people ask her: "Aren't you getting too old to be collecting recyclables?" she smiles and replies: "The more I do it, the more healthier I am!" But I know she wants to repay the Tzu Chi volunteers who have helped us. 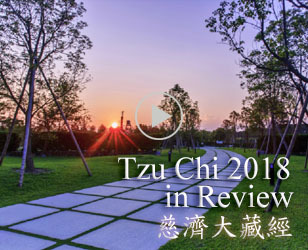 I started to get to know Tzu Chi and got involved with them the same year. I started collecting donations even though I was not yet in training. But I know that is my path, so I will take bigger steps towards it. Also my second daughter is now studying in the Tzu Chi College of Technology. Every time we speak on the phone, she shares with me her life in school. My sister is also a Tzu Chi volunteer and her son Zi-han is in Tzu Chi's basketball team for youth. She often attends the humanity classes and urges me to attend. She is more diligent than I.
Dear fellow volunteers, brothers and sisters, I thank you again. You are the bodhisattvas in the world, always thinking about others and constantly helping them. I will take my gratitude and use it to emulate your work, honor my parents and do good. Always Believe that There is "Love in the World"